No engine fitted. Previous engine removed. 12 volt, 3 batteries charged by: shore power Two 16 amp 240 AC ring mains from shore power. New battery bank (360AH). 3KW Pure Sinewave Inverter fitted. A full survey September 2018, including sonic testing, re-painting to the gunwales, and underplating is now completed. Polystyrene insulated throughout and secondary glazed. No holding tanks as a Marine Sanitation Device is fitted. Futon in lounge area can be a 4'6'' bed. New self venting tumble dryer (2019) with outside venting. This delightful Hasselter Aak is a remarkable combination of historic charm and modern living. Externally, the boat is bright and appealing, with numerous attractive characteristics, including the cabin-top and deck garden areas. Inside, the owners have created an open and warm home, benefiting from bedrooms in three cabins, a raised seating area and open-plan galley and saloon. There is extensive space throughout, for both living and work, currently including a small workshop area and artist’s studio, both of which could be converted for other uses. The current owners have completely refitted the boat, designing innovative energy efficient and environmentally friendly solutions along the way. These solutions include all-round polystyrene foam insulation, secondary glazing and a Microphor marine sanitation device, removing the need for a holding tank. Indeed, the boat’s creative sustainability is also featured in Gill Heriz's book about inspiring, comfortable homes, built by pioneering owners. 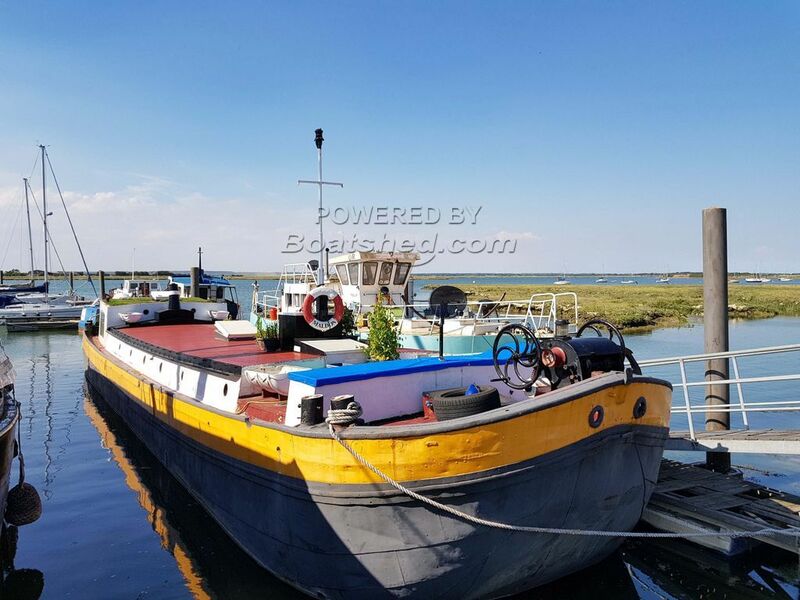 Although the boat has no engine, it is mobile, having been moved around berths along the East Coast of England, several times in recent years, which is no more cost and less burden than a standard house move. The boat is also sold with a full, recent survey, including sonic testing and re-painting to the gunwales. During my visit to this boat it was apparent that the owners have invested significant time, thought and resources into creating a tidy and appealing home, which is perfect as a unique floating home, with the ability to relocate whenever required. During September - October 2018, the boat underwent a comprehensive, dry-dock survey and some specialist underplating refurbishment, as shown in the pictures. This Dutch Barge 24m Hasselter Aak has been personally photographed and viewed by Chris Markham of Boatshed Essex. Click here for contact details.